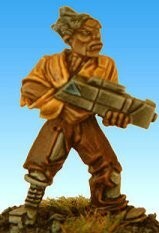 Colonel Marbles Miniatures Masterworks December 2002 !! 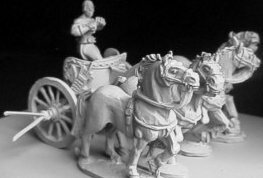 Here's a few pics of some new Westwind 'Gladiator Wars' chariots - anyone for a refight of Ben-Hur ? 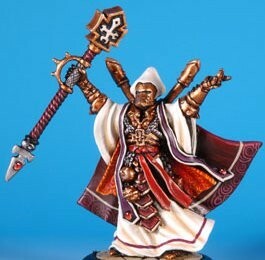 Here's a genuine new thang, the pics for the new 100 Kingdoms figures. 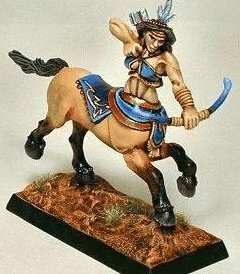 Lord of the Hunt and the Mustang Archer are pretty good I reckon, nice to see some decent centaurs on the market. 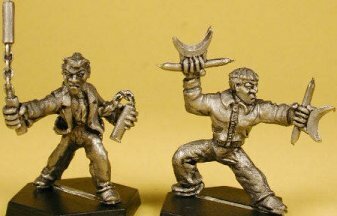 All sculpted by Bob Murch (also of Pulp Figures). Bit disappointed at the Geisha though, looks a bit like a trannie. 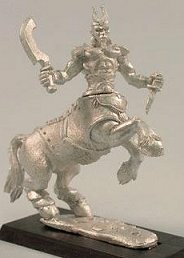 Yeah, those centaurs are nice - well proportioned and dynamic. Its a figure you often see executed badly. 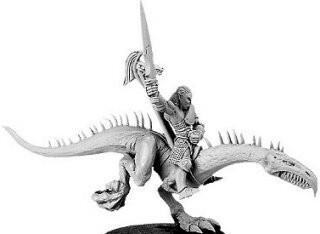 Might make valuable allies for a flagging Wood Elf army mebbe, eh? 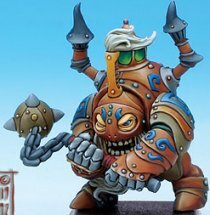 Bit of a larf - like the big bulbous Deathball jobbie. Looks just like Orc engineering to me. Here belatedly are the latest greens from Dark Ages. Oo, I do like 'Wail'. 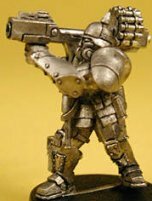 The 'Weaponsmith' isn't quite up to par though is it? They're getting better and better I reckon. 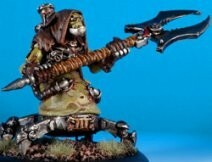 I have liked all the Dark Ages stuff so far, excpet perhaps the heavy fetish items, but the guy/girl with the fat gun does nothing for me. Always wondered why future guns are bigger than present day models. This one looks like one of those portable keyboards that were popular in the seventies. And it has a phallic magazine. 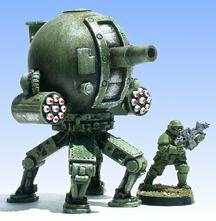 I think the principle is that future weapon developments would allow them to safely fire a larger caliber shell, and improved personal armour makes larger slugs more useful. Much as artillery weapons increase in bore size during the 20th century I spose. I would think a move to fletchette weapons more likely, but that doesn't appeal to the 'Split Second' mindset does it? Here's some good old fashioned sacrilege. 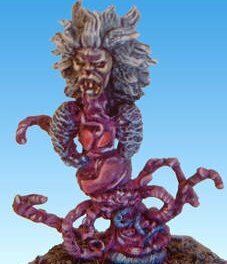 Rackham are my favourite fantasy range, but aren't the releases getting a little bit samey? And what happened to the SF range? 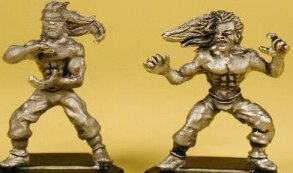 - they could well have been the coolest figures ever designed. And I mean ever. The Fianna is just a rehash of the musician, so a tad disappointing. 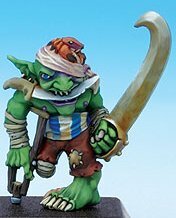 The gobbo is cool - he may be missing the odd appendage but he's still fighting fit and ready to do some damage - not like yer average elf ready to mince off back home 'cos of the a broken fingernail or split end. Atch I thought the goblin sucked. 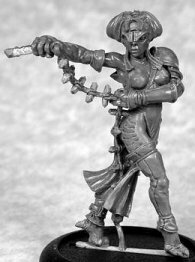 Pulp Figures have these nice 'Dangerous Dames' out soon. 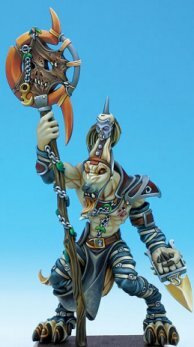 Seems like their models are getting better with each new release. Yeeeees. Almost there. The Khaki pair look almost Copplestone. A buy for me. Yea, those are good, I especially like the female air force officer in the first set! 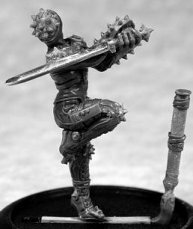 Assuming thats more of Bob Murch's work, wonder why that Geisha came out so pants for 100 Kingdoms..? They're a bit minging, but the aviator's cool. Here's some newish I-Kore stuff, including a couple of promo limited edition releases. 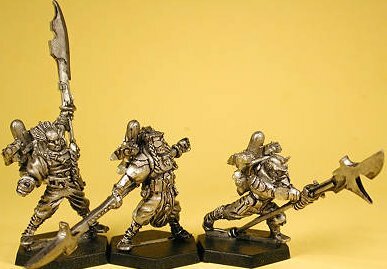 Two more brand new figures from Rackham. Ok they are a bit samey (esp. 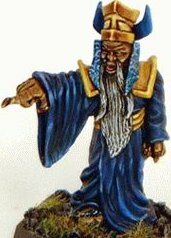 the dwarf), as Siggo mentioned about the last set of Rackham figures posted, but that crazy cleric type-dude is still top-notch in my book. Hey, don't listen to me. I am a bit jaded, so may soon have my Frother Licence revoked! They are still great figures, I'd just like to see something new. But as Confrontation seems to be still strong (surprising, this) then I can see why they would want to do more for the game. 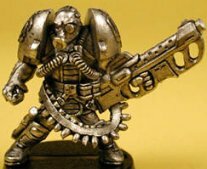 Its a very quiet time for new mini's in the run up to Xmas, but Warmachine have snuck in with some nice new sci-fi figures. Pretty nice. 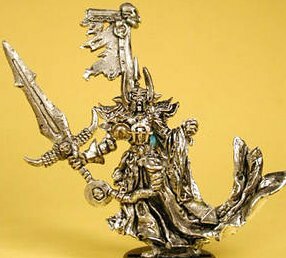 I like the Scrutator and the dynamics of the Magehunter are great, but top notch really goes to the Scrapthrall undead cyborg thang. 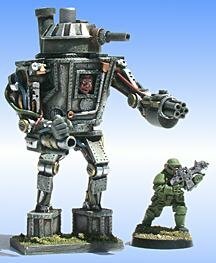 Totally wicked, love this - puts GW's lameo Necrons to shame. Must have it. 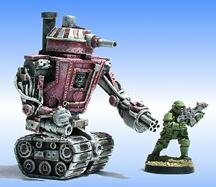 I'm becoming a big fan of the Cobalt sci-fi line, and these latest pics have done nothing to dampen my enthusiasm. 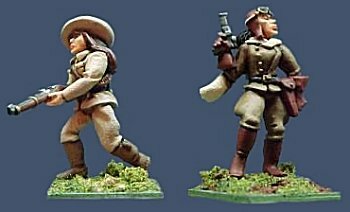 Some of the first release figs I saw at Salute were nice, but a bit chiselled and lacking in finesse detail wise. Fair play though, I think they're getting better. 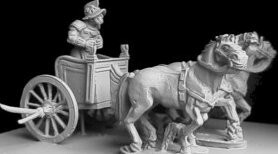 Here's just a small sample of some tremendous new range of figures for what promises to be an exciting new game - Chinatown. Pretty mixed bag there. 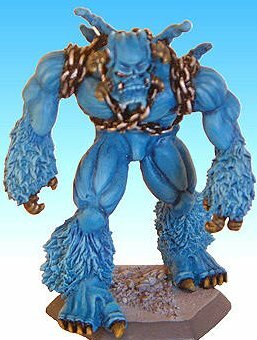 The blue ogre thing and the blue baldy chap are the best I think. 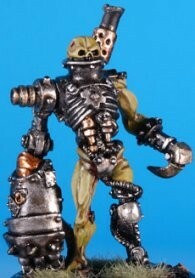 Finally Excelsior have stirred themselves to produce new Warzone & Chronopia figs! 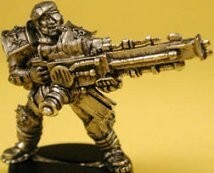 I'm well impressed with the sci-fi ones, not so sure about the fantasy minis. Anyone else find the resemblance between the lower left excelsior pic and the ZN-Games Necrowielder striking? 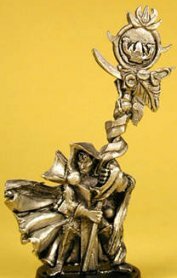 And of course the old Heartbreaker sculpt the Necrowielder was based on. Bledsoe would get a big chuckle out of that I'm sure were he still around. 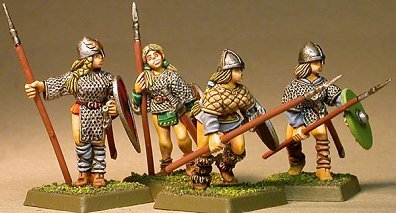 Vendel finally have new Dwarves and Elves out. Whoa, those are a big letdown. 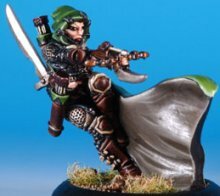 Bowmen with hoods=elves? I could easily just use these as picts (if pict bowmen weren't a lot cheaper). 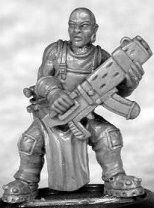 The Dwarves just look like badly sculpted dark ages militia. Thats a long wait for not much, I hope their halflings are better- the ones in the "9 Adventurers" #kofkof set are pretty tasty, wish they were available separately. 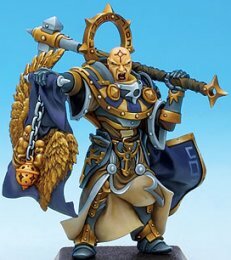 Their new greeks look great though! I like these. 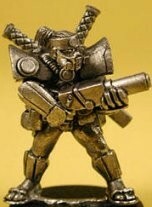 It's very different from the common (read GW) take on dwarves. Far more realistic IMO. Same old elf figures though... - The Imp.